Packages and prices are below these two highlight videos showing the results of my work at two different wedding receptions last year. They were shot by the awesome video team of Trever and Harrison of Southsixty.com. 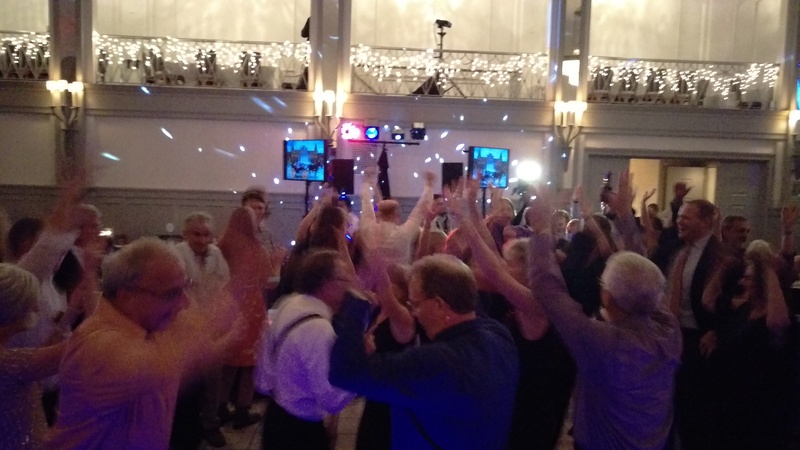 Mobile DJ and Master of Ceremony (MC) services for wedding receptions are typically for 5 hours. Your sound system will be top-of-the-line quality with music selections and announcements that are carefully customized and personalized through face-to-face meetings, as well as through email or your choice of virtual media. 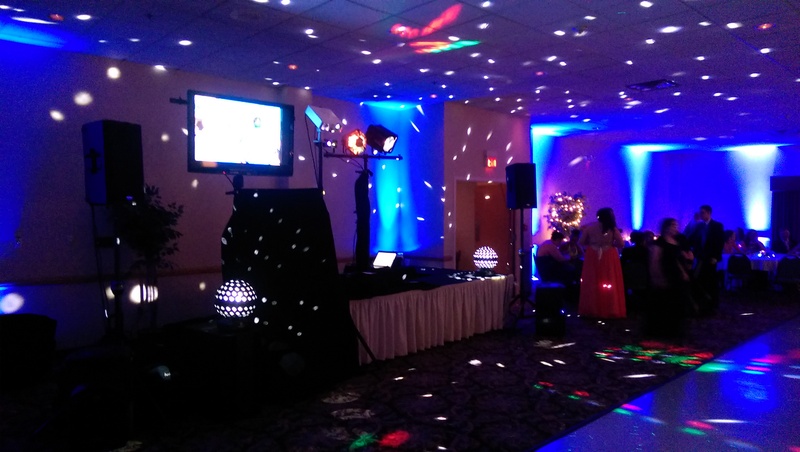 Unless there are unusual circumstances, my DJ/MC Services are priced at $1270. 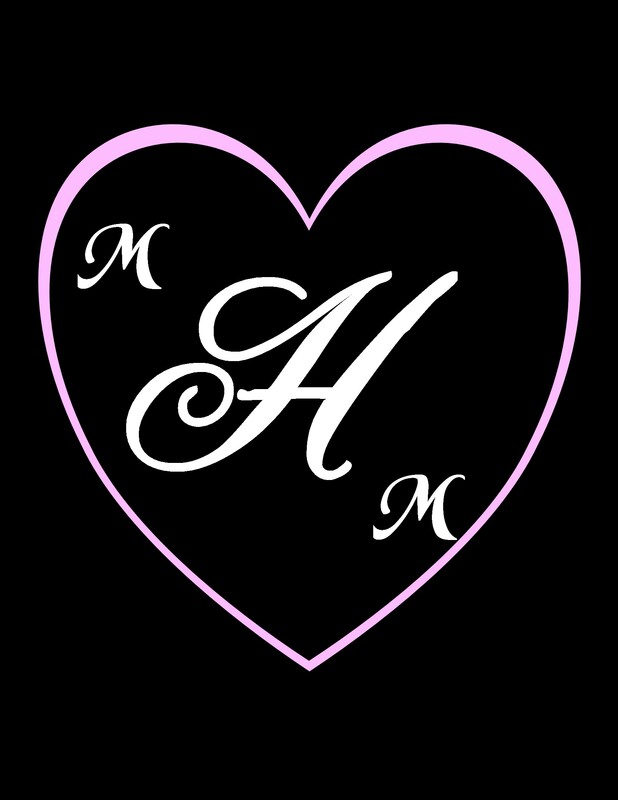 I can provide music and microphones for your ceremony if you need them. Musicians/soloists can plug into our system. Wireless lapel microphones are available for easy and nearly invisible amplification of your vows. My fully-curtained, state-of-the-art & touch-screen photo booth is your most popular wedding enhancement. 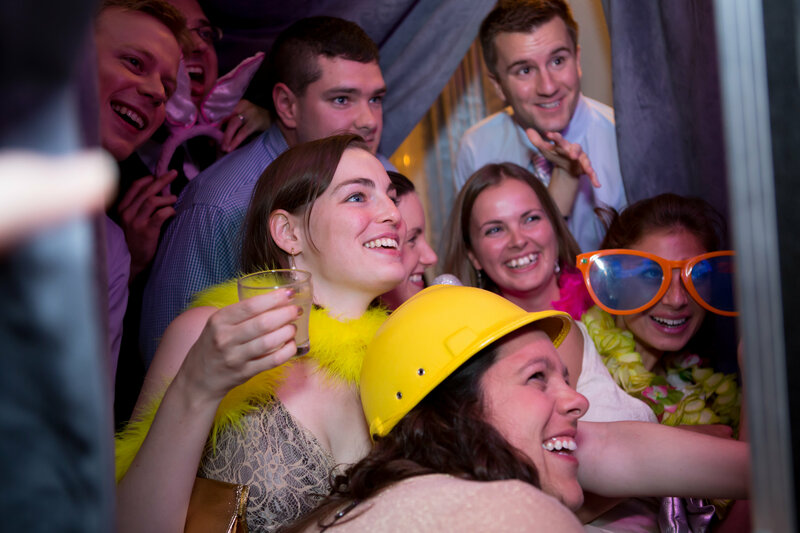 The hottest trend in weddings is a photo booth. Your guests will love the unlimited sittings and the two identical photo strips that print out immediately. One strip is a personalized wedding favor for them to keep and the other can go in your scrapbook/guest book that we help them with. Your booth will include a helpful attendant, the 8.5 X 11 scrapbook, paper, pens, adhesive, dress-up props, and a flashdrive of all the images in high resolution given to the bride and groom at the end of the reception. 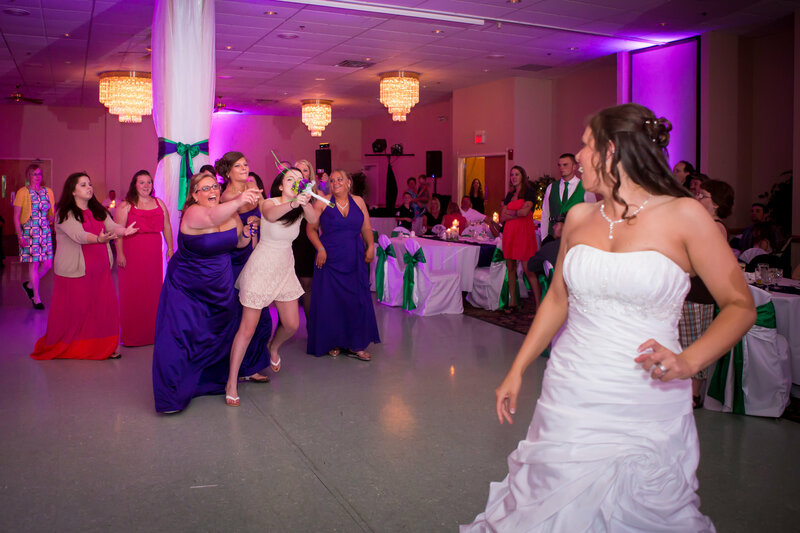 We help your guests build photo memories that last forever! How many guest books have you seen where people write nothing more than their name? 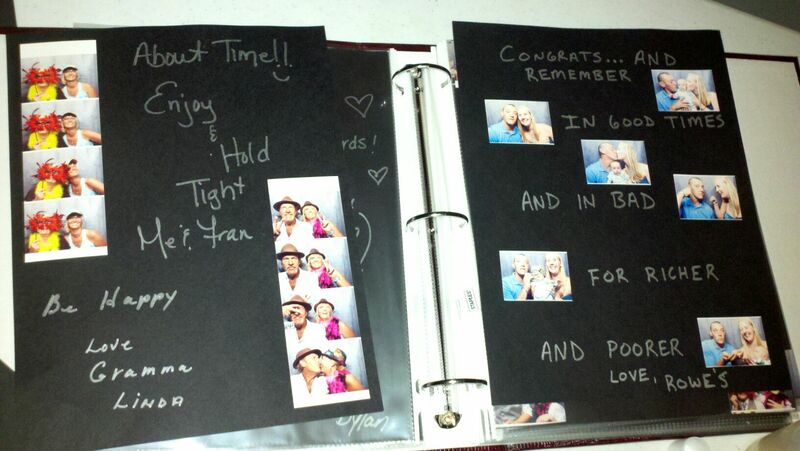 With a photo guest book/scrap book, your guests will get creative with their notes to you. That is exciting enough, but add in the fun that takes place inside the booth and you’ve injected a whole new level of excitement into your party! Pricing is $895 if purchased alone. You save $215 by getting it as a package with my DJ services and pay only $670. More photos of the booth here. Pictured below to the left left is an example of how uplighting can show up in your photo album. 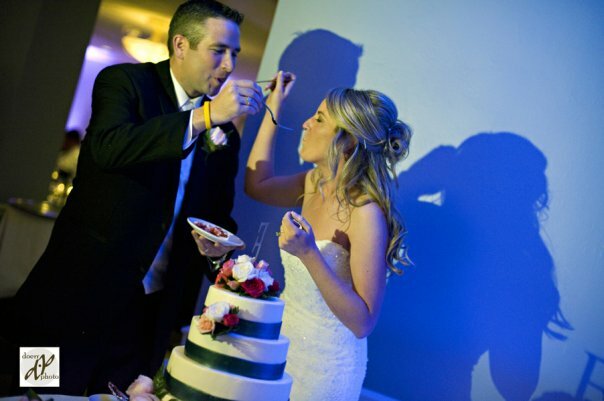 At this wedding, the uplighting matched the bridesmaids dresses and gave a refreshing splash of color to the cake cutting. Pricing is $370 for 16 lights if purchased alone. You save $100 by getting them as a package with my DJ services and pay only $270. That is only $16.88 per lighting fixture! Additional lights are available if needed (up to 28). 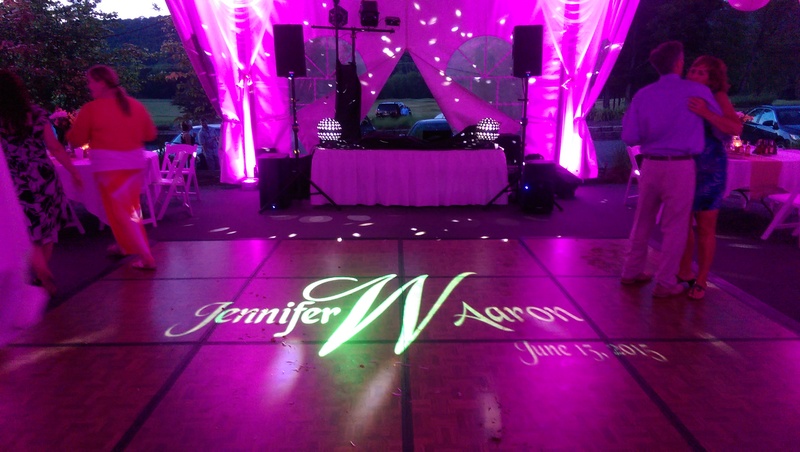 Uplights can change color to highlight your special moments. 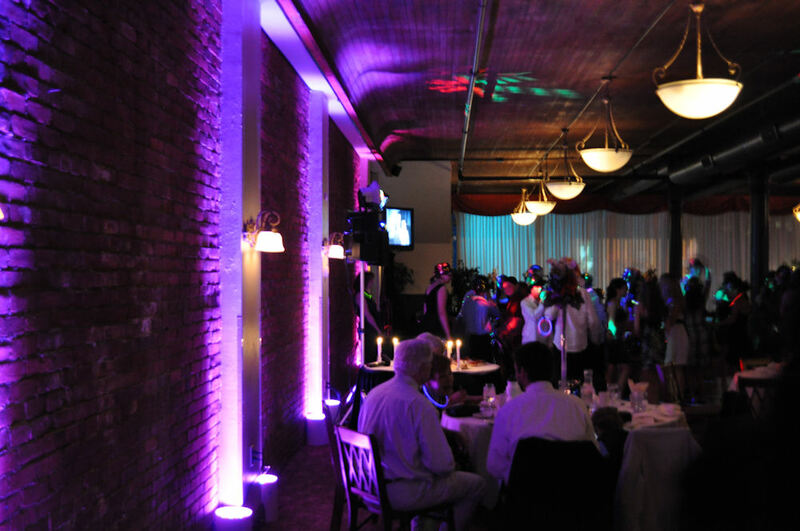 Uplighting can be used at an angle to fill wall space. 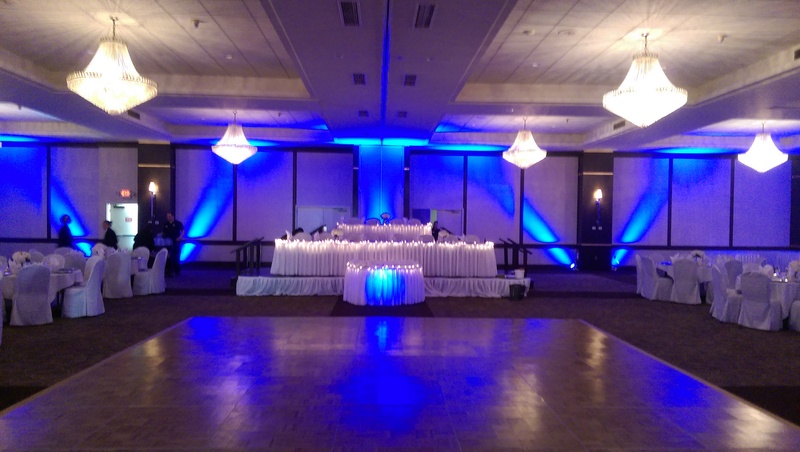 The uplighting can stay as one color during your reception, and/or it can do various colors and patterns via a wireless computerized connection. The room shown in this video is the Holiday Inn Arena in Binghamton, NY. 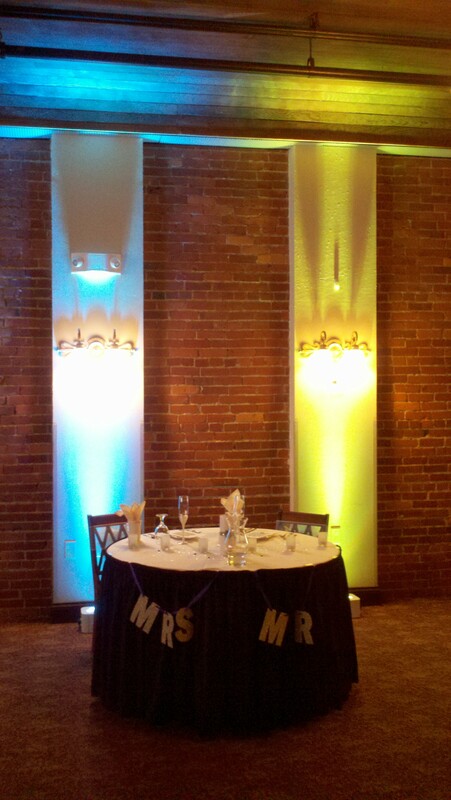 The video was taken with my cell phone, so the actual colors at your wedding reception would be much more vivid. 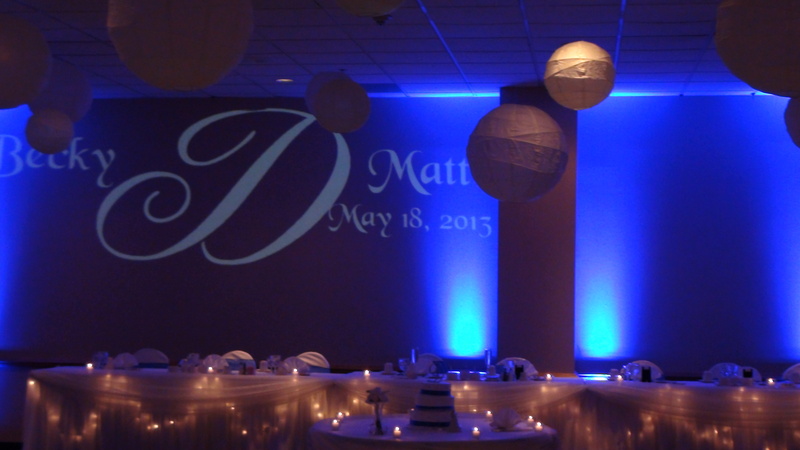 This Projected monogram on the wall includes the Bride and Groom’s first name, last initial and wedding date. Pricing is $270 if purchased alone. You save $100 by getting this as a package with my DJ services and pay only $170. Get a second projector for a slideshow or for one image on the wall and another on the dancefloor. Pricing is $50 off for a second one. You save $150 by getting this second one as a package with my DJ services, and pay only $120 for the second one. Several monogram examples are pictured below. 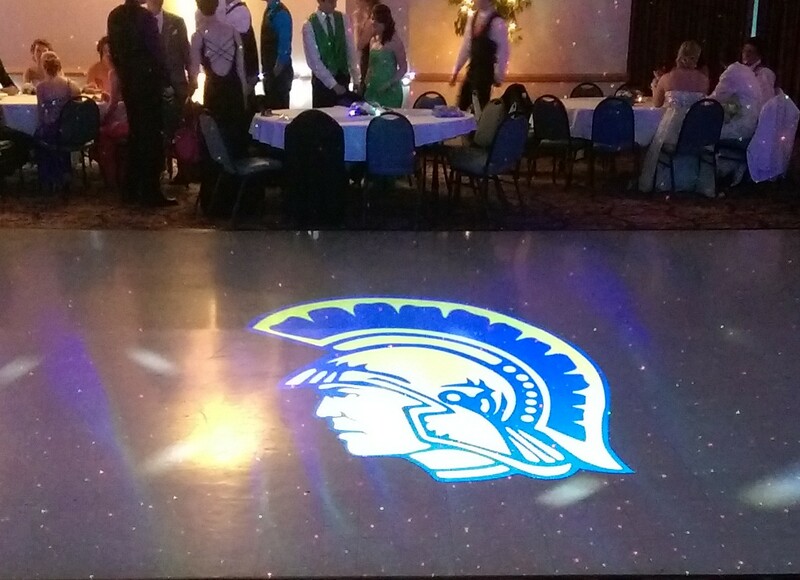 We can use any font, letters, an image, or even words when we create your own Projected Monogram. The bride and groom’s first initials on the outside with a heart in the middle. 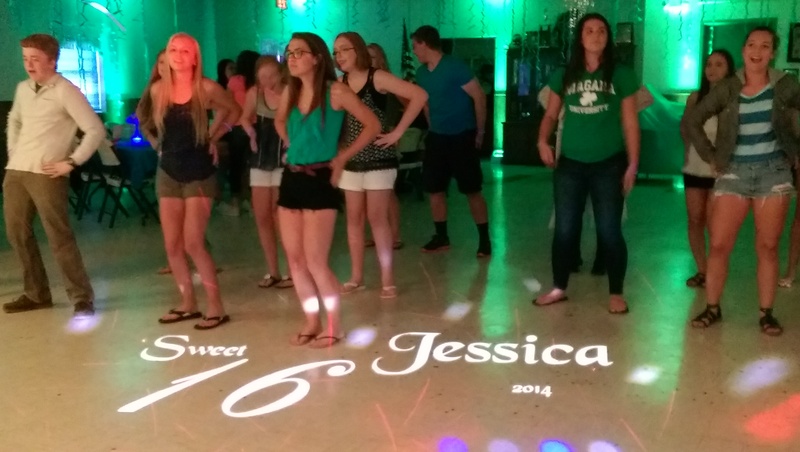 Projected Monogram at a Sweet 16 party. 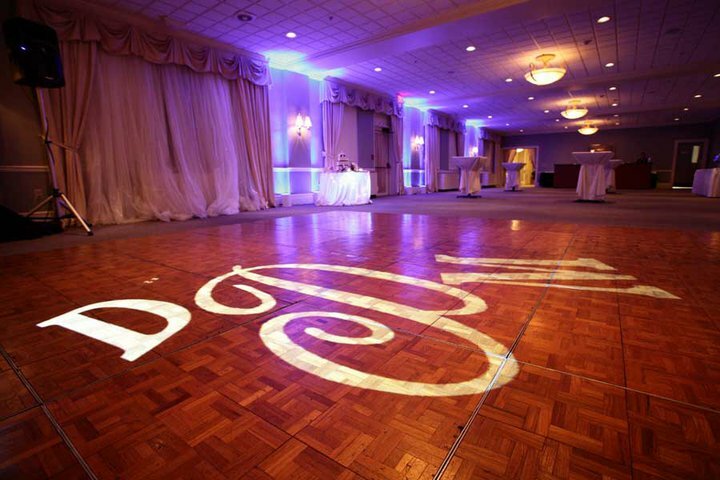 Uplighting at The Traditions with the Bride and Groom’s Monogram on the dance floor. A 50 inch LED screen is available on a stand that goes up to ten feet high; thus making it visible to everyone in the room. Pricing is $270 if purchased alone. You save $100 by getting this as a package with my DJ services, and pay only $170. 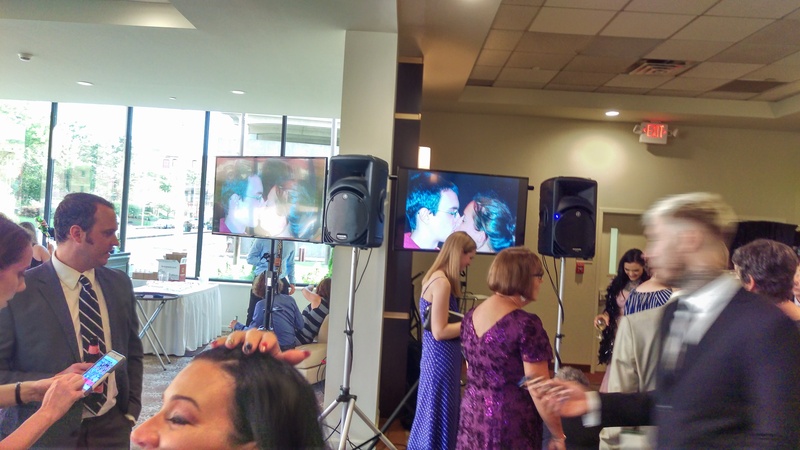 Two 50 inch matching LED Screens on stands up to ten feet high and set at different angles to allow greater visibility for your guests and more flexibility in their placement. Pricing is $50 off for the second one. You save $150 by getting this second one as a package with my DJ services, and pay only $120 for the second one. The screens are high enough so everybody can see them. Here they are being used in the cocktail area angled away from each other in order to reach both sides of the room. A photo of Johnny’s dancing lights, uplights in the background and flat screen up on a stand. 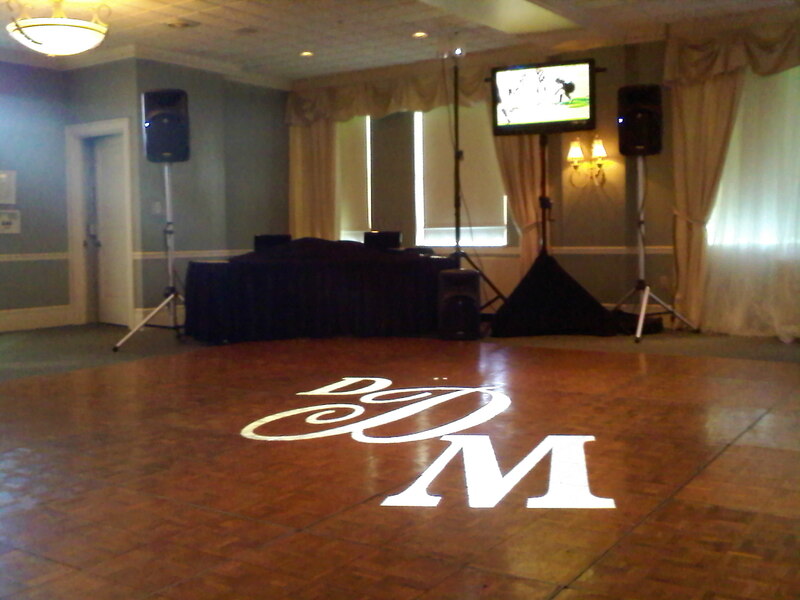 Projected Monogram on the dance floor with a flat screen up on it’s stand next to Johnny Only’s table. 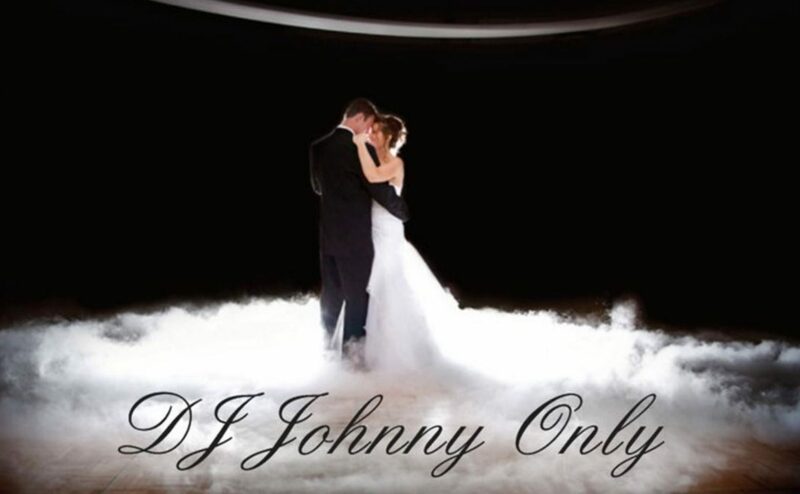 When requested, I can do custom remixes for the first dance or other special moments. I have very sophisticated software that allows me to do this seamlessly for no extra charge. Listen to a couple who chose to personalize their first dance with their own voices. This is an incredible way to add uniqueness and personalization! Another wedding couple’s first dance voiceover can have a completely different feel. In this case, fewer words seemed to work better with the song. Listen here for voice-overs only in the beginning, middle(2:20), and end of the song(3:20). 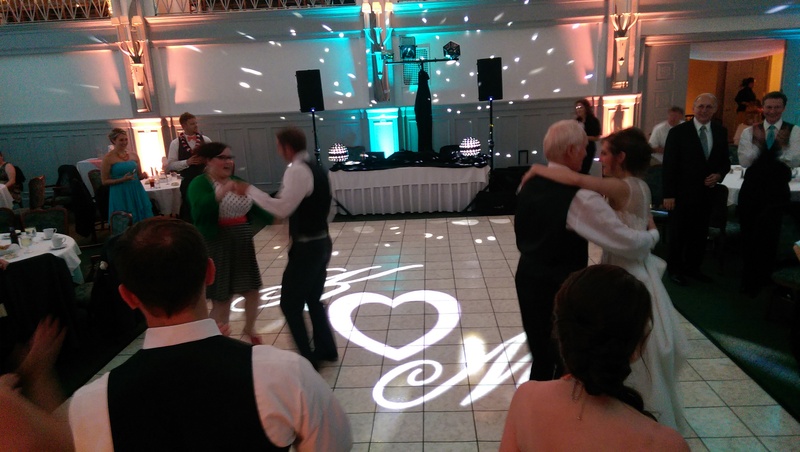 A voice-over I mixed for Michael & Rachel: Note my uplighting in the background and the effect of the couple’s monogram, which I have projected on the dance floor. There is a second sound system available for ceremonies, multiple room events, or to fill extremely large areas. If I am setting it up at the same address as my main system, it is $170 for the extra complete system. OR you may only need an extension speaker(s). For just an extension speaker, $70 per speaker. What does my announcing voice sound like? This video clip will give you a pretty good idea.